No matter what your thoughts are on the Trump beating up CNN wrestling gif, it’s good publicity for WWE and I’m sure Vince is happy. Yesterday, Trump posted a WWE gif that got the internet going crazy. As the title of this topic says, no matter what your thoughts on the WWE gif that Trump posted on twitter, it’s good publicity for WWE on both sides of the spectrum. Trump got the right and the left talking about WWE. In other words, Trump just gave WWE a pretty big shout out yesterday. To those of you that don’t know, Trump and Vince McMahon has a long history together. They go way back so they’ve been friends for a long time. Back in the 80’s, Trump had a few Wrestlemania events at Trump Plaza a long time ago in Atlantic City. Trump has always been supportive of WWE and the wrestling business. That’s why Donald Trump got inducted into the WWE Hall of Fame and it’s why Trump got the opportunity to perform at Wrestlemania 23 for the “Battle of the Billionaires” storylines and take part in the “Hair vs. Hair” match. No matter what peoples thoughts of Trump’s WWE gif are, I’m sure Vince is happy that the political world is talking about WWE. So could the American people start tuning into WWE shows like RAW/SD/NXT/PPV’s? We’ll see how WWE ratings do now that Trump gave WWE a shoutout. It could get more people interested in wrestling. I’m pretty positive Vince would have no problem of Trump posting that wrestling gif so don’t get your hopes up if Vince is planning on suing Trump ’cause it won’t happen. Vince and Trump has been friends for years. They’ve always been business partners too. 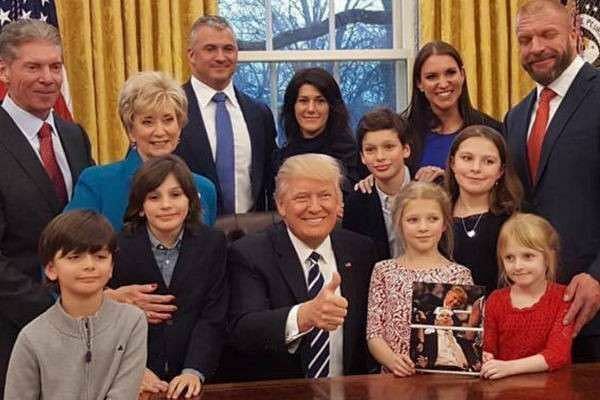 Trump has always been pretty close to the McMahon family and the proof is in the pic above. Vince’s wife who is Linda McMahon is part of the Trump admin. as she works for the SBA. Could ratings for RAW and Smackdown go up a little this week after Trump posting that gif? We’ll wait and find out what happens. Previous PostI understand where Trump is coming from ’cause I go through the same thing he’s going through…Next PostIs Sly teasing that Ivan Drago could make comeback for “Creed 2”?? ?